I was in Japan serving out my military contract and came across an opportunity to climb Mt. Fuji. My friends and I debated for a while only because of the cost of the trip. We had to take a bus from Yamaguchi Prefecture (southern portion of mainland Japan) all the way to Mt. Fuji. From there, we would take another bus into Tokyo for two nights in the city and then head back to Yamaguchi Prefecture. We decided to embark on this adventure and it was the best decision I made while I was in Japan. poncho with water proof gortex pants. We left Yamaguchi Prefecture on a Thursday night and arrived at Kawaguchiko 5th Station late Friday morning. It was a very long bus ride, but it was nice since I was with my friends and about 30 other people from the area I lived. Also, we were able to sleep throughout the night since the bus was very comfortable. Kawaguchiko station is about 2300 meters above sea-level. So, we were driving up the mountain for a while which helps out a lot. Enjoying the view as we went up and noticing our ears “popping” along the way was entertaining. When we stepped off the bus at Kawaguchiko station, we are all excited. First we stretched our legs out which felt great, then we grabbed our gear for the hike, and walked into the little town at the station. I was amazed at the fact there were so many amenities this far up the mountain. There were shops, restaurants, a hotel, almost anything you could want. We all made sure we had enough water and all of the gear we wanted to bring. Then we all bought our climbing sticks. It is very common to buy a climbing stick on Mt. Fuji. As a hiker makes the climb, different stations can be visited where they can get there sticks stamped with the elevation and station number. This makes a great souvenir from the adventure to the top of the mountain. As I remember correctly, the climbing stick only cost 1000 yen, which is fairly cheap. After we purchased our climbing sticks, we began our hike. 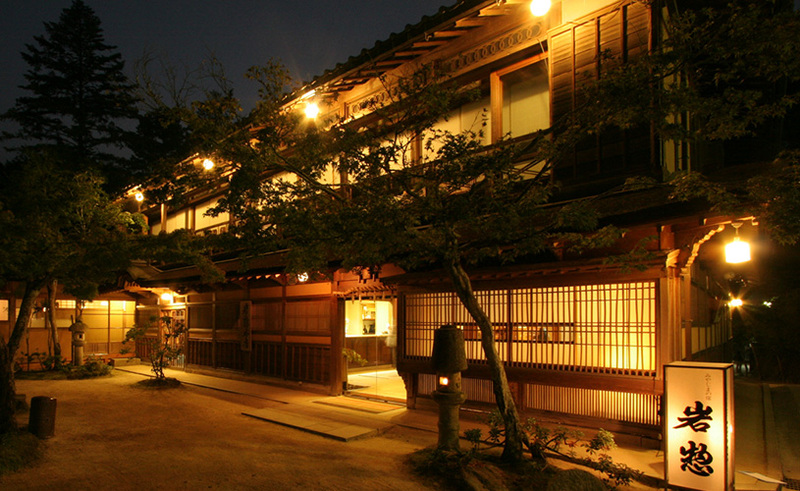 The trail we used is called the Yoshidaguchi Trail. It is known as the oldest and most common trail to use on Mt. Fuji. As we were walking, the number of buildings that lined the streets began to dissipate and eventually, there were no buildings. There were many trees and it was a very serene feeling. There were other people around, but it was not busy and the mountain looked great. I could stare toward the top on the mountain and see it disappear into the clouds above. It was exciting knowing that we would be hiking up to and beyond that point. The trail itself switched from being a random walk-able path to a more steep section where we would use our hands a bit, and back again. Along the way, we were able to overhear many different languages which was interesting knowing that there were people climbing this mountain from all across the world. 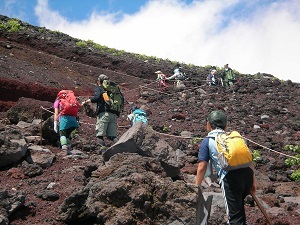 We also noticed that there was a surprising amount of younger kids as well as older citizens of Japan making the hike. I found this very impressive. Along the way up, we would stop every now and then to take a break and drink some water. I was in very good physical condition at the time, but I still found it necessary to take a break. We also had some slower hikers in the group and we wanted to stay together, so if we got ahead of the pack, we would wait for them. Which we did not mind because it gave us a chance to relax and snap a few photos along the way. It seems like every 45 minutes we would come across a little hut with one worker sitting next to a fire with a few iron rods with stamps on the ends sticking in the fire. This is a hut where the hikers can get their climbing sticks stamped. You pay the man 200 yen and he burns a stamp into the stick giving your current elevation and the hut location. Like I said before, this makes a great souvenir and I highly recommend buying one and paying for the stamps. We hiked all the way until the evening and stopped at the 8th station. At this point I could really tell a difference in the level of oxygen in the air. I was breathing heavy when I was hiking and my heart was beating very fast to get what oxygen was available throughout my body. However, when I stopped at the 8th station and caught my breath, everything was fine. My heart was just beating a little faster than normal, which was fine. I had no desire to purchase the cans of oxygen that were available at this point. I though it was just a waste of money, but it can prove useful for people who are feeling the effects of altitude sickness. I decided to splurge a little bit and buy some noodles and drink at a little restaurant. The noodles were instant noodles that you can buy at the store and to drink, I bought a sports drink. The meal cost around 1300 yen which is expensive, but the noodles were warm and the drink was cold, so I was happy. We also snapped a few photos because we were above the clouds and it was sunny. It made for great pictures of us on Mt. Fuji. The weather at this point is definitely cooler. After having a chance to cool down, it was rather chilly. All 30 something of us stayed in a little loft that had just enough room for everyone to lay down. We joked on how it resembled a can of sardines because of how tight together we were. However, we had a futon to sleep on which was great because by this time we were exhausted. While we were in the loft, we had to decide if we wanted to hike to the top of the mountain in the morning for the sunrise, or just wait at the 8th station for the people who decided to go to the top. A majority of us wanted to climb to the top. We had to wake up very early Saturday morning, so we went to sleep soon after the discussion. When we woke up and looked outside, the weather was absolutely terrible. It was dark, cold, and raining sideways. Everybody was in shock at how drastically the weather changed. When another hiker proposed the question of “who still wants to go to the top?”, a select few, including myself, still wanted to make the hike. There was no way I hiked to this point on the mountain, to just go back down. We all got our rain gear out and put it on. We also took out our flashlights and clipped them onto the front of our backpack straps, then left the loft. The flashlights we were using worked great for lighting up the whole path. They were the standard military issue flashlight with a 90 degree bend near the top. Regardless, the weather was horrible. It was very windy and we really had to be careful so we did not fall or get blown over. Our pace was very slow, but we crept along until we reached the top. There were many huts at the top, including a gift shop. The most important one was the hut where we received our final stamp. It was very fulfilling to get that last stamp. We obviously did not get to see the sunrise and were not able to take any scenic photos either. I was kind of disappointed but there was nothing I could do about it. Next, we stepped into a larger shack to take a breather, snap a few photos, and dry off. We didn’t feel like it would be a good idea to hike around the crater, so after we were rested, we put our rain gear back on, and headed down the mountain to the 8th station to meet with the rest of the group. 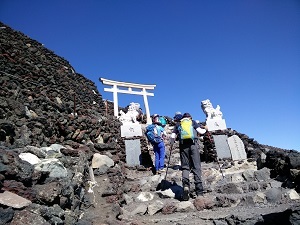 The hike from the top of the mountain to the 8th station was not so bad. It was still raining, but by this time we were used to it and just wanted to get back to Kawaguchiko station. We still took the hike slow because everything was wet and the wind was still blowing hard. We made it down to the 8th station faster than what it took to get to the top from that point, which was nice. We made it to the loft where everyone was waiting and took a short break. After everyone gathered their belongings and the few people that made the trek to the top were ready, we began the decent down the mountain. The trail down the mountain is different than the one that goes up it. The trail was zigzagging all the way down. This made the decent easy and fast, but very repetitive. There was no need to take a break because the rain stopped falling, the wind died down, and the oxygen level rose with every step we took. Plus, we were all excited to get back down so we could hop on the bus to Tokyo. My friends Patrick, Doug, and I were the first people to make it back to Kawaguchiko Station out of our group. We found a decent restaurant to relax at. We took our packs off along with a few layers. Then we bought some breakfast, and talked about the hike. It is supposed to take 5-7 hours to get to the top and we felt that was accurate. The climb down seemed fairly quick though. It is supposed to take 3-5 hours to get down but we think it was right around the 3 hour mark. Other people from our group began to trickle in and our conversation began to grow and more stories were being told. We all admired our walking sticks and laughed at the people that didn’t make it to the top. Soon as we had everyone from our group, we gathered our things, and walked to the bus which took us to our hotel in Tokyo. Hiking Mt. Fuji is definitely my favorite memory of Japan. It also stands out as one of the best experiences I have had in my life. The people that we met along the way were very friendly and we were also able to gain some insight into Japanese culture. For further information about hiking Mt. 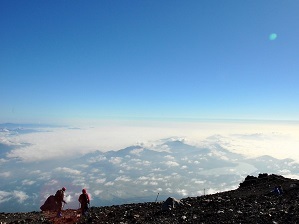 fuji, please visit japan-guide.com.